Sandee’s not such a fan of the new theme here at MaisonBisson. Without really telling me that I should have discussed the new decor with her before making any big decisions, she does say she feels it doesn’t suit her style. There are lots of ways to resolve the, um, difference of opinion, but we decided that just as Sandee gets most of the authority regarding the kitchen and I get the office, we can find a way to share the website. The result is Nest. Sandee’s picked out the drapes and carpet, I’m tweaking the installation and moving the relevant stories from our back catalog in. It’s a little amusing to see our tag cloud prominently reflecting our interest in drinks and homemade sweets, but i guess those are the things that we enjoy sharing most. 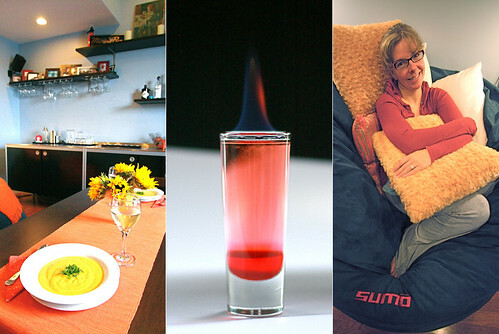 Pictured above are scenes from the top stories: a toast, our submission to AT’s Fall Color contest, and the Sumo Sac review. I hope to eventually create a combined feed of the blogs, but if you’re interested you can follow the Nest feed here.